You don't have to edit a Render Feature to preview it. Simply ensure that the settings are set up to how you desire. Then click the preview buttons within the toolbar. Further updates to improve the completeness of the Render Task View. 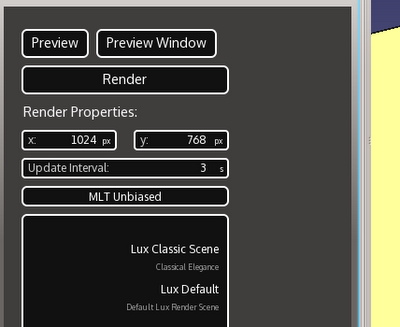 Render Presets and Templates are correctly set from the combo boxes. 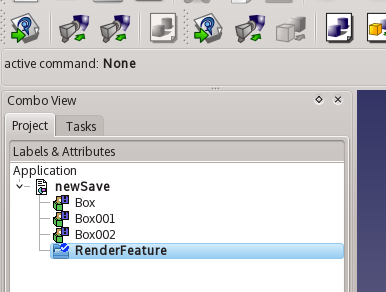 All render materials that have been assigned within the Render Feature are now displayed in a list view. These can be selected and deleted, or if double clicked , the material properties can be edited. When editing a Render Feature, all materials that are assigned to any objects has some Material Labels displayed. 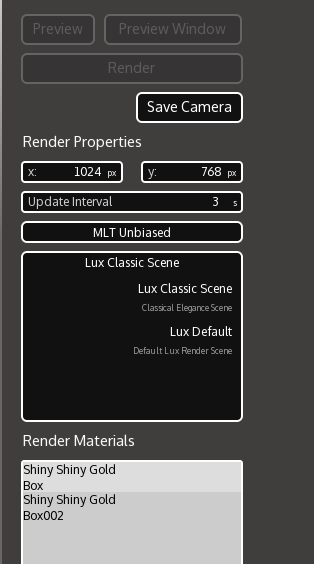 This is very basic admittedly, but for now will suffice to help keep track of what materials are assigned within your scene. The inclusion of the Render Templates was the last remaining major feature that was to be implemented. This has further been improved so that they are positioned in a more optimal place respective to the scene geometry and the camera. This is not perfect but is certainly ideal in most cases. We can more easily now zoom really far out like this. 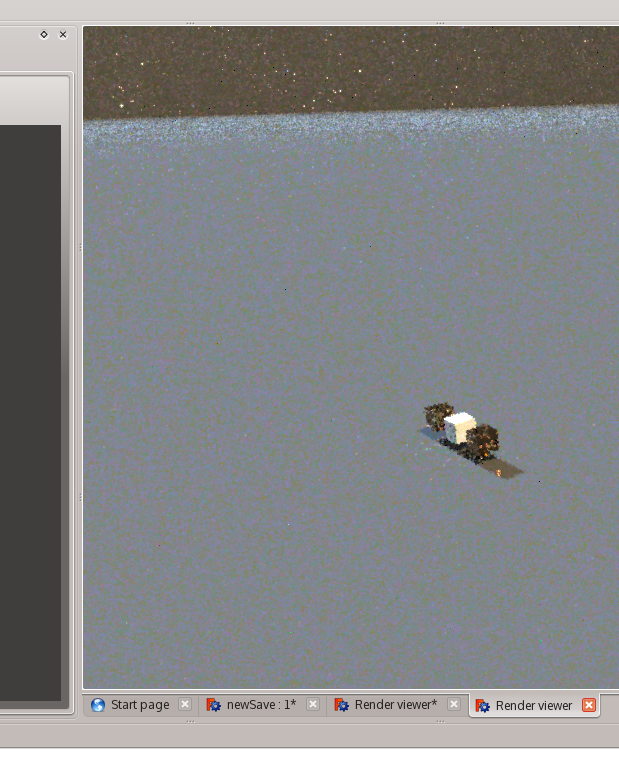 The Render Template will take into consideration the bounding box of the visible parts in the scene and the camera itself. It will move the template to the middle of the scene bounding box and then scale it according to furthest point away from the bounding box center. 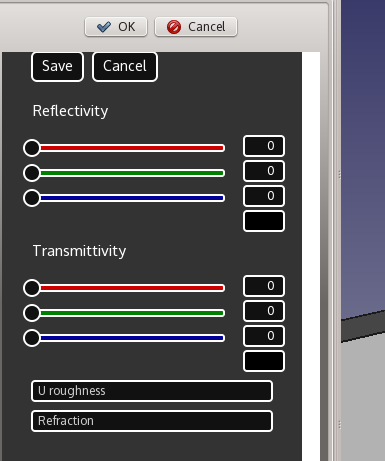 I have finished of the material selection interface, so you can set and edit parameters. Now this has undo-redo system built in making things easier. On a similar note materials and cameras can be saved. (Material properties aren't saved yet). 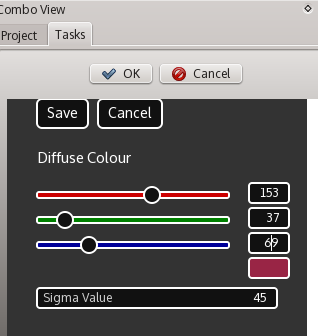 The colour chooser and number inputs now correctly retrieve and store values. It needs refinement but most importantly is function. Ideally it needs a button to allow more sophisticated selection from a QtColorChooser Dialog. Other ideas are having predefined material presets, which become more important on more complex materials such as plastics and glasses. Well that's most of the major changes! I need help with testing and making materials and templates for people to use.